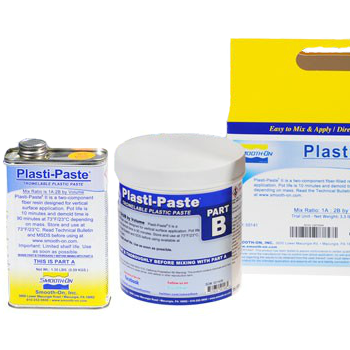 Plasti-Paste is a two part fiber resin designed specifically for vertical application as it will not sag. Dries to a light but firm surface that can be sanded, machined, and pigmented. Can also be used as an adhesive in repairs for a variety of industrial applications. Pot life is 8-10 minutes and it can be handled in approximately 90 minutes (this depends on the mass of the object.) This product is sold in a 3.4lb trial size. Please visit Smooth-On.com for additional technical information and project ideas!